Final assembly will take place at SLAC, and is still two years off. “Right now, every piece of the camera is under construction in various places,” says Roodman. 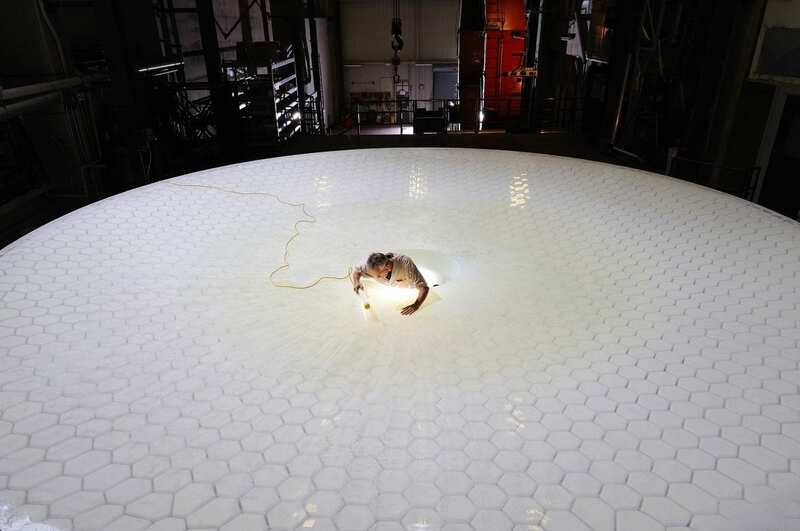 The sensors that will actual capture the light from stars are being assembled at Brookhaven National Laboratory. Lawrence Livermore National Laboratory is shepherding the construction of the optical lenses. A device for putting different color filters in front of the camera lens is coming from France. Roodman offers to take me inside the clean room. You can’t just walk into a clean room. You have to put on gloves, a hat, booties and an extremely clean white coveralls. Fully garbed you look a bit like an Easter Bunny. Once inside, Roodman points to a small box with cables coming out of it sitting on a lab bench. “All by itself this little unit is a 144-megapixel camera,” he says. That’s six times more megapixels than a high-end digital camera. There will be twenty-one of these boxes in the camera. Roodman says they have to measure things to an accuracy of two microns. That’s about a twentieth of the thickness of human hair, depending, of course, on how thick your hair is. At another test bench, some graduate students are trying to make sure that the interior of a dark box is completely dark, and they’re having a problem blocking out the glare from some LED lights mounted near the box. Roodman suggests putting some black tape over the lights. Then he laughs.